Narelle is Sydney born and bred but lately she’s lost her sense of belonging. Something keeps bringing her back to Pyrmont. This peninsula was her family’s bedrock, and the home of her extraordinary grandmother June, who held everything together through the decades: a son’s brush with the law, a daughter’s battles with demons, a husband’s decline. A story of Sydney – work and corruption, family and massive social change. A story of how Australia went from working class to middle class. Best of all, the great Kris McQuade returns to Belvoir. Warning: This production contains some strong language. Single tickets to The Sugar House are now on sale. Subscribing remains the cheapest option. Book tickets as part of a subscription and save up to 31% on the single ticket prices below. † Concession prices are available with a full-time Australian student card, all Centrelink Pensioner concession cards and Veteran Affairs’ cards. For 2018 productions, these prices can also be accessed by Industry members of Actors Equity (MEAA), AACTA, ASMA, ASDA, ARDA, AFTT, Australian Academy of Dramatic Arts, Actors Centre, Performance Space, Australian Writers’ Guild, Artshub and the NSW Writers’ Centre. ^Tickets to Sunday performances have an added $5 surcharge. …as credible, tough, and romantic as a Dickens saga. …warm-hearted and affectionate, even as it critiques corruption, destruction and social injustice. Directed by Sarah Goodes, the production has a held in quality which balances so nicely with the lovely comic moments…And costuming [by Emma Vine]…Without any showiness, there is detail everywhere, replete with character and class and period. This expansive and moving story is sensitively directed by Sarah Goodes. [Sacha] Horler’s Margo delivers some of the strongest scenes as she burns with the kind of rage only found in those who always feel they are playing second string. The Sugar House is a play about the human capacity for undying love and wilful perseverance in the face of immense pain and suffering. [Josh] McConville and [Sacha] Horler are stunning, both equal parts bravado and vulnerability in their respective roles, with Horler stealing the show with a particularly poignant and layered monologue. The Sugar House is an interesting and important work as it explores the stories of the people that are usually erased from the history books and the landscape…A wonderfully presented new Australian story that should be seen. The Sugar House is a ripper play that delves inside Sydney’s social history. Not to be missed. 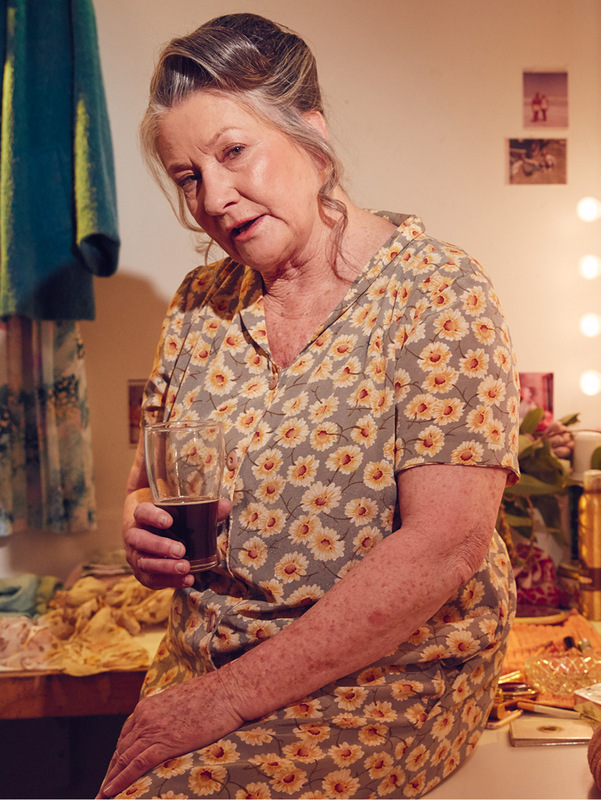 [Sheridan] Harbridge’s portrayal of Narelle is perhaps her finest performance on Sydney stages to date. The Sugar House is a gift of theatre; an exploration of who we were, who we are and who we wish we could be. Writer Alana Valentine, Director Sarah Goodes and actors Kris McQuade, Nikki Shiels and Lex Marinos discuss the creation of the new Australian play The Sugar House, set in Sydney’s Pyrmont from the 60s till the noughties, a time of great social change. Produced for Belvoir by Zoe Ferguson. When I first read Alana’s play I was struck by the family drama at the heart of it: the often tragic triangle of tension that lies within families – two people who don’t know how to love each other and one person stuck in the middle. However at the same time, it’s a play about Sydney – Australia’s biggest and fastest changing city. This beautiful play examines Sydney’s past through the Macreadie Family, exploring the city’s criminal history and the idea of inherited shame. It skates between the personal and political in a way I haven’t experienced in a new work for a while. I wanted to tell this story with a focus on sunlight and actors in a nearly empty space. The main design springboard was the photography of Max Dupain and Olive Cotton and their shared fascination with Sydney’s dazzling light and deep shadows. I knew lighting designer Damien Cooper would have a field day creating these moods in this space he knows so well. So too for designer Michael Hankin whose familiarity with and knowledge of the Belvoir building enabled him to conceive a design that celebrates the factory origins of the theatre while allowing the magic realism of a memory play to emerge. Costume designer Emma Vine has meticulously researched the era and unearthed gems and costumes from magical places. Composer Steve Francis and I talked a lot about the kind of music we needed to evoke the famous dancing Sydney light. He has written beautiful pieces to Alana’s lyrics, and Michael Toisuta’s soundscapes weave it all together. Of course the core of this work is the writing and the actors who bring it to life. They are a rare and insanely talented group of performers who have been a joy to work with. Something in Alana’s play feels bigger than us all – it amplifies the complexities of families’ inheritance, shame, love, and living in a city as big, beautiful and, at times, ruthless as Sydney. We hope you enjoy being with it as much as we have enjoyed bringing it to life. Nostalgia is not always a soothing experience. It can produce rage at things unnecessarily destroyed and pain from a sense of irretrievable loss. In February this year I was invited to speak to the Pyrmont History Group. They hold their meetings in the former CSR Pay Office in Pyrmont, across Refinery Square, and next to the refurbished Cooperage which supplied the former CSR Distillery. I was told that the group brings together ‘survivors of urban renewal and newcomers to the high-rise apartments that have replaced the cottages and the industrial buildings of CSR’. I suggested that we might read an excerpt of my work-in-progress play with local community members and, thankfully, several readers volunteered. One was a former judge, another a former teacher, and many were residents of the Jacksons Landing community. Jennice Kersh, a longtime Pyrmont local, had brought with her a volunteer called Barry, who had been a rabble-rousing union organiser. There was something about the authenticity of the place and the interaction of the readers which transformed the small community gathering into something very precious to me. In much of my work as a dramatist, I strive to privilege voices which are drawn from diverse communities of interest. I do this because I believe in the value of connection and the piquancy of verity. I want to find freshness in the supposedly familiar and work with artistry with my theatre colleagues to bring that to audiences. In The Sugar House I have also drawn deeply on my own life and memories as a resource for the drama. Although Pyrmont is a real site for the many conflicts between change and progress that play out in this and other cities, Pyrmont is also the ultimate metaphor for the unsolvable tensions inherent in both an individual and a community. The tensions between the value of the past, the needs of the present and the contract with the future. This fabulous Sydney suburb, which in 1992 declared itself the Republic of Pyrmont and issued passports to non-residents, is a potent dramatic frame for the obligations and decisions which we as individuals and citizens have to make every day. What to keep. What to discard. When in 2017 The Sugar House was given an in-house reading by Belvoir, Eamon Flack described how, later, everyone in the office began to speak about their own families, about what had been facilitated to get them to their present reality. It is an enduring gift that he had the confidence to believe that the play might induce those same discussions in the Belvoir audience: to talk to each other about the ‘not always soothing experience’ of nostalgia as a provocation for how we decide the relative importance of respect for history and opportunities for change; to commune with characters who struggle to be equal to their ancestors’ ambitions and want to understand how they came to be who they are; whose identity is deeply linked to their past even when it changes in the present; and, who need to reach into that past to resolve unspoken and uncomfortable truths. I thank Neil Armfield for commissioning this play, and those who have offered dramaturgical advice, including Sam Strong, Anthea Williams and Wesley Enoch. I acclaim Sebastian Born, the former Associate Director (Literary) of the National Theatre, London, for his endorsement of this play. It was written for Kris McQuade and I cherish the honour of having such a legend on stage in my work, Sheridan Harbridge is my deepest idea of Narelle, Sacha Horler’s vitality and courage is a sincere inspiration, Josh McConville who is as dangerous and beautiful as my own Uncle Ross, to whom this play is lovingly dedicated, Nikki Shiels whose talent is astonishing, and Lex Marinos, a respected elder of our profession who brings his calm, clear magic to this ensemble. When Sarah Goodes came with me into the Mitchell Library to look at original Max Dupain negatives, commissioned by CSR in the 50s and 60s, and which I had requested be thawed out from cold storage, I knew that her commitment to and passion for this work would transform it in remarkable, urgent ways. My thanks to the genius of her team, Michael Hankin, Damien Cooper, Emma Vine, Michael Toisuta and Isabella Kerdijk, and the cleverness of the Belvoir production staff including the departing Sally Withnell who will be much missed. To Steve Francis, whose work as a musical collaborator I continue to treasure. And I pay special tribute to Shirley Fitzgerald and Tim Peach, Mitchell librarian Helen Benacek, my agents Sharne McGee and Wendy Howell, Vicki Gordon, and Justice Terence Sheahan, former NSW Attorney General, whom I interviewed about the passage of his legislation in 1985 which finally abolished all capital punishment in Australia. Kris McQuade. Photo by Daniel Boud.